We are delighted that you are visiting our web site. When you and your non-profit organization work with us, you will receive “Hands On” guidance, support and direction from me as well as our experienced, trustworthy consultants and associates as your organization’s needs require. We work diligently to fulfill our consulting firm’s Mission, “To empower the compelling vision, mission and unique programs of your non-profit organization by creating and implementing personalized strategies for successfully leading effective fundraising campaigns to strengthen your non-profit organization.” We welcome the opportunity to learn more about your non-profit organization's fundraising needs and to help you successfully meet these needs. 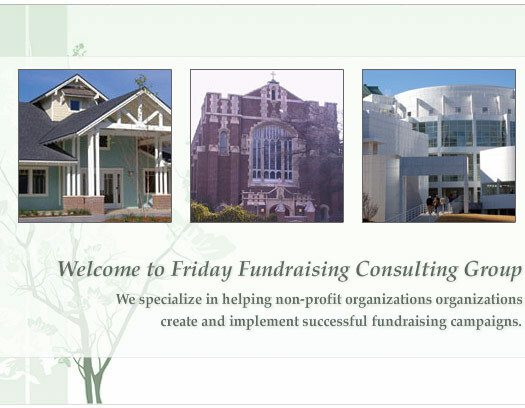 Many thanks again for visiting Friday Fundraising Consulting Group. There are two kinds of people in the world, the givers and the takers. The takers eat better but the givers sleep better.